MADISON, Wis. - Local disability advocates are coming together to ask Netflix to remove comedian Tom Segura's "Disgraceful" standup show. Representatives from the Boys and Girls Club of Dane County and the Madison Metropolitan School District gathered at Gigi's Playhouse on Wednesday to send a message that the word "retard" is not acceptable. "You can't say retarded anymore," Segura said in the comedy special. "People get very upset. I don't really support the arguments against it." "Now you can't say that. You gotta be like, that's not smart. Your idea has an extra 21st chromosome, if you ask me," he continued. More than 85,000 people have signed a petition to ask Netflix to remove the sketch and issue an apology. The Madison community is joining the cause, and encouraging others to get involved. "The R word is not a joke, never has been. It's not meant to be a punchline," said Nicki Vander Meulen, a member of Madison's Board of Education. 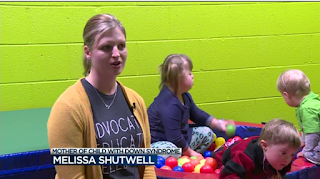 "Letting people think it's okay to bully or target people with Down syndrome is completely unacceptable," said Nancy Gianni, the president at CEO of Gigi's Playhouse. The nonprofit in Madison is one of 35 locations. The space is a Down syndrome achievement center providing free educational and therapeutic programming. The founder's daughter Gigi created a video directed at Netflix. At the press conference, Michael Johnson, the president and CEO of the Boys and Girls Clubs of Dane County, vowed to become an advocate and supporter of Gigi's Playhouse and to make sure each club is properly serving and supporting local families with Down syndrome. "These are beautiful people. These are our people, these are smart young men and women that live in our community," said Johnson. Parents said although they can't change Segura's way of thinking, they can stop Netflix from airing the program. "When kids use it, when adults use it - please intervene. There are different words to use that can describe whatever is happening," said Danielle Kaiser, the mother of a 13-year-old with Down syndrome.